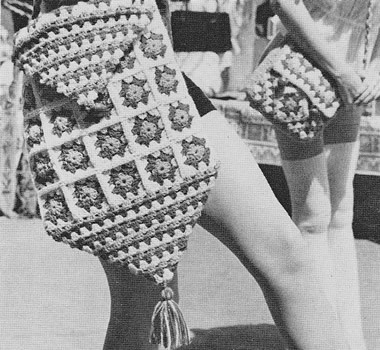 Summer season bags in crochet this time - for beach - or for festivals if you want the full seventies vibe. Easy to make using a single basic granny square motif. 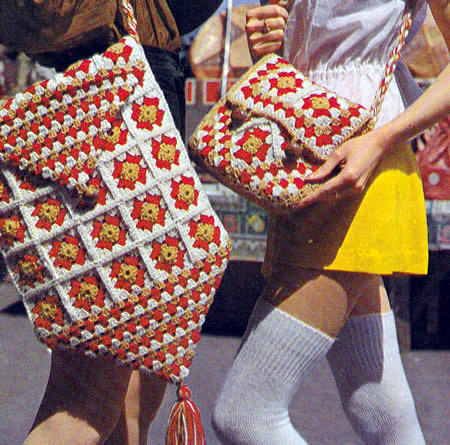 The bags are made up by joining a number of the same basic "granny square" motif. 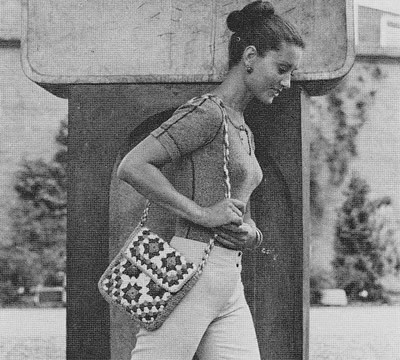 If you are feeling adventurous you could make up your own version of the squares to approximately the same size or you could use a variety of colours (in the "granny square" tradition) to use up wool oddments. With Gold (G) make 4 ch, join into ring with slip stitch (ss). Join motifs as follows: wrong sides to inside, place 2 motifs together. loop on hook, (this completes the join - you are essentially slip stitching the motifs together). Continue in this way, ending at ch sp at opposite corner. Now make a square by joining 2 strips together using the slip stitch technique as before. Make another square the same. You now have two squares made up of 4 motifs and one oblong made up of 2 motifs. 1st row: in G, 3 ch, 2 tr in corner ch sp, (3 tr in sp between next 2 groups) twice, 3 tr in centre of joining row, (3 tr in sp between next 2 groups) twice, 3 tr in corner ch sp [7 groups]. Turn, 1 ss in each of last 3 tr of previous row. each following sp [6 groups]. 3rd row: in Cream (C), as 2nd row [5 groups]. Alternating colours as before, work 4 more rows, thus ending 3 ch 2 tr in G worked in sp between 2 groups. [1 group]. and ending with corner ch sp already used. Work the other main part in the same way on the second 4-motif square. next 2 groups) twice, 3 tr 1 ch 3 tr in next corner ch sp, (3 tr in sp between next 2 groups) twice, 3 tr 1 ch 3 tr in next corner ch sp Continue in this way all round strip, ending 3 tr 1 ch, in 1st corner ch sp again. Join with ss to top of ch at the beginning of the round. of ch at beginning of round. 3rd round: in C as 2nd round. [ 8 stitches, including turning ch of previous row which counts as 1 tr]. Repeat 2nd row until strip measures 24 inches (61 cm). Using a warm iron and damp cloth, press parts lightly on wrong side. Cut lining as for 2 squares and gusset, allowing ½ inch (1 cm) extra all round for turnings. Pin gusset round 3 sides of each square; sew in position by stitching tip of each group of main part to edges of gusset . Sew flap to remaining side of 1 square. Using G, work 1 row dc, along 3 free sides of flap, working 3 dc in each corner and making a 10 ch loop at each end of long side approximately 2 inches (5 cm) in from the edge - these are the button loops (see photo). Make twisted cord from 18 strands of remaining yarn, each strand 100 inches (254 cm) long (or however long you want the shoulder strap to be), and attach to top of gusset at each side of bag. Join lining and place inside bag with seams to inside, turn in raw edges at top and inside flap, and slip hem neatly in position. Join 6 strips together, thus having an oblong. 1st row: in G, 3 ch 2 tr in corner ch sp, * (3 tr in sp between next 2 groups) twice, 3 tr in centre of joining row; repeat from * ending 3 tr in corner ch sp [16 groups]. Turn, ss in each of last 3 tr of previous row. 2nd row: in R, 3 ch 2 tr in sp, between first 2 groups, 3 tr in each following sp [15 groups]. 3rd row: in C , as 2nd row [14 groups]. Alternating colours as before, work 13 more rows, thus ending 3 ch 2 tr in G, worked in sp between 2 groups. [1 group]. Working along opposite edge of oblong, work as for point. In make a 10 ch loop into centre of last group (button loop). Join 5 strips together, thus making a square. Work as for back, making one point for bottom of bag and omitting flap. Cut lining as for front and back, allowing ½ inch (1 cm) extra for turnings. dc up side of extra motif of back. Join second side in the same way. Work 1 row dc along upper edge of front. Using a flat-stitch seam, join points by catching together tips of each group. Make twisted cord as for handbag and attach to sides. Using 18 strands of remaining yarn, each strand 12 inches (30 cm) long, make tassel and attach to point. Sew on button to match loop. The yarn is an Aran or worsted weight in balls of 50g. 1 ball each in three colours: Cream, Lipstick Red, and Harvest Gold. 4 in Cream, 3 in Lipstick Red and 2 in Harvest Gold. One No 8 (4mm) crochet hook. About 8 inches (20cm) square. About 14 inches (36cm) wide and 20 inches (51cm) high. The original yarn was Patons Capstan - an Aran weight yarn knitting to a tension of 18 sts to 4 inches. No clues as to the yardage but it was a fairly dense pure wool so I would not expect it to have a long yardage.